Gene therapy in animal models of rheumatoid arthritis: are we ready for the patients? Rheumatoid arthritis (RA) is a chronic inflammatory disease of the synovial joints, with progressive destruction of cartilage and bone. Anti-tumour necrosis factor-α therapies (e.g. soluble tumour necrosis factor receptors) ameliorate disease in 60–70% of patients with RA. However, the need for repeated systemic administration of relatively high doses in order to achieve constant therapeutic levels in the joints, and the reported side effects are downsides to this systemic approach. Several gene therapeutic approaches have been developed to ameliorate disease in animal models of arthritis either by restoring the cytokine balance or by genetic synovectomy. In this review we summarize strategies to improve transduction of synovial cells, to achieve stable transgene expression using integrating viruses such as adeno-associated viruses, and to achieve transcriptionally regulated expression so that drug release can meet the variable demands imposed by the intermittent course of RA. Evidence from animal models convincingly supports the application of gene therapy in RA, and the feasibility of gene therapy was recently demonstrated in phase I clinical trials. Rheumatoid arthritis (RA) is an autoimmune disease that is characterized by chronic inflammation in the synovial joints that leads to progressive destruction of cartilage and bone. There is still dispute as to what initiates RA (e.g. autoantigens, bacteria, or viruses). There is, however, a general understanding of the inflammatory process that drives the pathological changes that are observed in arthritis. There is consensus that cytokines in particular represent the fuel of the inflammation, and that in RA cytokines (growth factors) and their inhibitors are imbalanced. A breakthrough came from work in transgenic mice [1, 2], which revealed that constitutive expression of tumour necrosis factor (TNF)-α causes inflammatory arthritis in the synovial joints. Also, blocking studies with neutralizing antibodies and later using the natural IL-1 receptor antagonist (IL-1Ra) and soluble type II TNF receptor (p75) identified IL-1 and TNF as the principle inflammatory and catabolic cytokines in experimental arthritis [3–5]. Restoring cytokine balance using biologics has been successful in many experimental models of RA. This work brought the anti-TNF strategy in RA patients to the fore, and the clearly demonstrated clinical effectiveness of this strategy led to an explosion in usage of biologically based medicines (biologics) . This raises the question of whether gene therapy can confer additional advantages or contribute to existing therapies. To answer this we must appreciate that the current anti-TNF treatments still have three major drawbacks. First, these treatments do not cure the disease, and cessation of treatment results in a relapse of disease in RA patients. Second, repeated systemic delivery is necessary to achieve steady and efficacious levels of the agent in the inflamed joints. The treatment does not take into account the fact that the clinical course of RA is characterized by variable disease activity, with spontaneous remissions and exacerbations of chronic joint inflammation. Ideally, drug application must parallel the intermittent course of the disease so that the variable physiological demands may be met, and so that unnecessary exposure of the patient to the drug may be prevented. Third, RA can last for decades if not a lifetime, and long-term treatment is therefore inevitable. This prolonged treatment per se carries a certain health risk because TNF is essential to normal immune response and tumour suppression. An increased risk for infection (tuberculosis) and motor neuronal degeneration, causing multiple sclerosis in RA patients, are downsides of anti-TNF treatment . In theory, gene therapy can provide long-term and regulated release of biologics directly into the arthritic joint, thereby enhancing efficacy and reducing systemic side effects. Restoring the cytokine balance by systemic or local gene transfer has been studied for more than a decade in experimental models of arthritis. There is compelling evidence that the hypertrophic synovium contributes to the maintenance of the chronic arthritic process. Furthermore, the synovium can transform into an invasive tissue (pannus) that destroys cartilage and bone. Synovectomy of a joint, performed surgically, chemically or by radiation therapy, immediately stops the arthritic process and delays recurrence of disease in that joint for many years . With gene therapy it may be possible to target the synovium and deliver cytotoxic drugs. This new approach, called genetic synovectomy, is currently under investigation in animal models of arthritis. This review focuses on the gene therapeutic strategies of restoring the cytokine balance and genetic synovectomy in animal models of RA, as summarized in Figs 1 and 2. Schematic presentation of the various gene therapeutic approaches that are used in experimental models of rheumatoid arthritis. We discriminate cytokine targeting and cell targeting as the two main gene therapeutic approaches to arthritis. In cytokine targeting, the objective is to restore the (local) cytokine balance in arthritis in order to silence the inflammatory process and/or to stop the destruction of cartilage and bone. Cell targeting is the elimination of cells from the inflamed joint in order to silence the disease. Genetic synovectomy is the strategy of killing transformed synovial fibroblasts with a connective tissue aggressive phenotype. Selective cell targeting of antigen-specific lymphocytes has major consequences for the inflammatory process, and inhibition of angiogenesis results in reduced pannus formation and synovial hyperplasia. The numbers in brackets indicate reference numbers. CTLA4, cytotoxic lymphocyte antigen 4; FasL, Fas ligand; HSV, herpes simplex virus; IKKβ, IκB kinase-β; IκBαDN, IκBα dominant negative; IL-1R, interleukin-1 receptor; IL-1Ra, IL-1 receptor antagonist; IL-1RAcP, IL-1 receptor accessory protein; IL-18BPc, IL-18 binding protein c; NFκB, nuclear factor-κB; ODN, oligonucleotides; SOCS, suppressor of cytokine signalling; TACI, transmembrane activator and calcium modulator and cyclophilin ligand interactor; TK, thymidine kinase; TNF, tumour necrosis factor; TRAIL, TNF-related apoptosis inducing ligand; VEGFR, vascular endothelial growth factor receptor; vIL-10, viral IL-10; TGF, transforming growth factor. 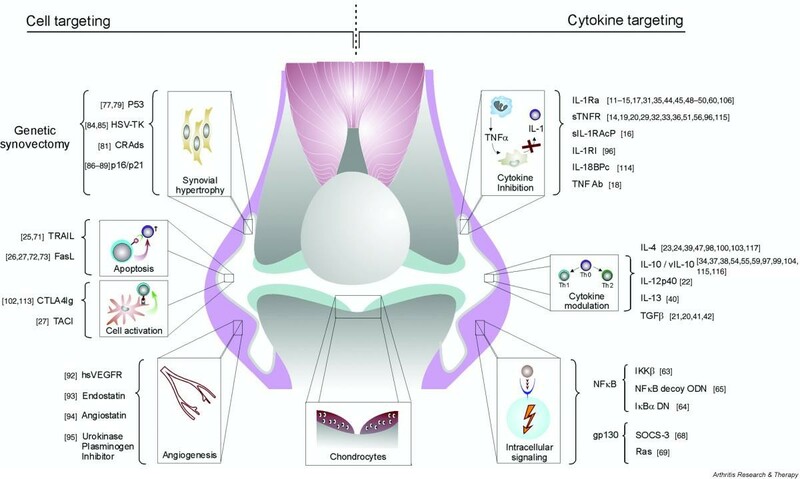 The strategy to protect cartilage and chondrocytes in arthritis given in this illustration are reviewed in detail by van der Kraan and coworkers  and by Evans and coworkers . Schematic presentation of the various gene transfer methods that are used in experimental models of rheumatoid arthritis. Central to gene therapy is the transfer of therapeutic genes to the site of inflammation. In the 'ex vivo' method autologous or allogeneic fibroblasts that are retrovirally transduced to express therapeutic genes are transplanted into inflamed joint. In 'adoptive cellular gene therapy', the transduced cells are either antigen-presenting cells (dendritic cells, macrophages, or B cells) or T cells (primary or hybridoma cells) that have the capacity to home to the site of inflammation. In the direct or in vivo method the therapeutic gene constructs (viral or nonviral) are directly transferred to the animal either locally (intra-articular, periarticular) or systemically (intramuscular, intravenous). 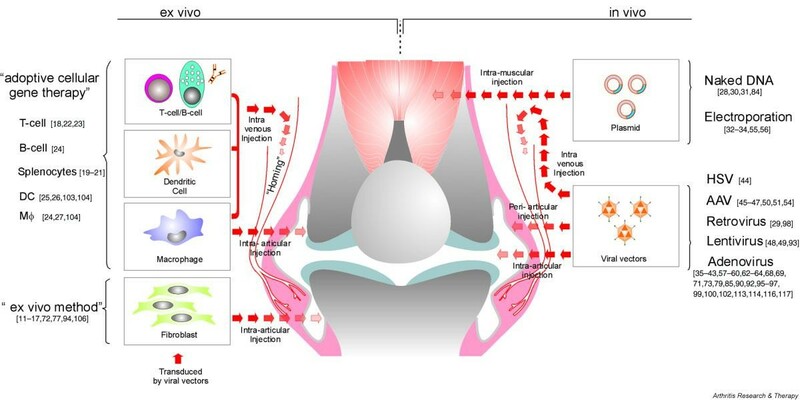 All of these routes of gene delivery have been successful in gene therapy for experimental arthritis, and some of them also exhibited a 'contralateral' effect (i.e. protection of remote untreated joints). The numbers in brackets indicate reference numbers. AAV, adeno-associated virus; DC, dendritic cell; HSV, herpes simplex virus; Mφ, macrophage. In animal models of arthritis it has long been recognized that proinflammatory cytokines, particularly TNF-α and IL-1β, play important roles in the pathogenesis. The relevance in vivo of both cytokines emerged from studies in which they were either targeted (with antibodies, antagonists or soluble receptors, or in gene knockout mice) or overexpressed (using recombinant proteins or gene transfer, or in transgenic mice) in animals, including mice, rats and rabbits . There is consensus that TNF is a potent proinflammatory mediator, whereas IL-1 is a potent cartilage catabolic mediator, and both cytokines can be produced independently in animal models of arthritis. Recent human trials of IL-1Ra revealed moderate efficacy, probably because of poor pharmacokinetics and the 100- to 1000-fold excess of this molecule that is needed to block IL-1 activity. This makes IL-1Ra an obvious choice for local gene therapy, with the aim of achieving high and constitutive expression. Apart from control by overexpression of cytokine inhibitors, additional control of arthritic and destructive processes by local overexpression of modulatory cytokines is an alternative. IL-10 and IL-4 are T-helper (Th)2 cell derived cytokines that inhibit TNF and IL-1 synthesis in synovial cells . Moreover, they suppress Th1 driven processes but promote differentiation of Th2 cells and humoral immunity. Viral IL-10 lacks immunostimulatory properties and is predominantly immunosuppressive, making it suitable for therapeutic application. The Th2 cytokine IL-13 is not as critical for immune deviation because it cannot directly act on T cells, but like IL-4 it can inhibit proinflammatory cytokine release in activated macrophages. Suppressor type T-regulatory cells (Tr1/Th3) are defined by their ability to produce high levels of IL-10 and transforming growth factor (TGF)-β, and these cytokines mediate the suppression of antigen-activated T cells to induce tolerance. These modulating cytokines or their antagonists can be used to restore cytokine balance, but they may have an additional advantage in targeting the autoimmune response in arthritis. The first local gene therapeutic approach attempted was transplantation of genetically modified cells into the inflamed joint. Autografts of human IL-1Ra-expressing synoviocytes protect against leucocytosis, synovitis and cartilage proteoglycan loss, which are induced by intra-articular IL-1 injection in the rabbit knee [11, 12]. The clinical feasibility of this 'ex vivo' gene therapy method was demonstrated in antigen-induced arthritis (AIA) in the rabbit, in which it prevents inflammation and preserves chondrocyte function by the overexpression of IL-1Ra or soluble TNF receptor (p75)–Ig fusion protein [13, 14]. In murine collagen-induced arthritis (CIA), a clear prophylactic effect was seen following local transplantation of histocompatible allogeneic transduced fibroblasts that expressed either IL-1Ra or the soluble IL-1 receptor accessory protein [15, 16]. The ex vivo method also yields a therapeutic effect of IL-1Ra in bacterial cell wall-induced arthritis in rats . However, this ex vivo method of retroviral transduction requires selection of synovial fibroblasts and their transplantation into the arthritic joint, which is laborious and requires autologous cells. An alternative ex vivo approach in arthritis is adoptive cellular gene therapy (ACGT). In this approach, primary spleen cells, T cells (including T-cell hybridomas) and antigen-presenting cells (dendritic cells [DCs], B cells, macrophages) are transduced ex vivo, either by retroviruses or adenoviruses, and transferred into the arthritic animal. CIA in the DBA1/J mouse and passively transferred CIA in the severe combined immunodeficiency mouse are the models used to evaluate the effectiveness of ACGT. In contrast to synoviocytes, these immune cells do not require local injection because they preferentially home to the sites of inflammation. Adoptive transfer of a collagen-specific T-cell hybridoma transduced to express anti-TNF single chain antibodies or IL-12 p40, or splenocytes from arthritic animals expressing TNF receptor or TGF-α all cause significant immune changes and ameliorate the disease [18–22]. Adoptive transfer of antigen-specific T-cell hybridomas or antigen-pulsed B cells or macrophages transduced to express IL-4 home to the joint and exert a prophylactic effect that relies on the anti-inflammatory property of IL-4 [23, 24]. A novel and effective approach to treatment of CIA is eradication of antigen-specific T cells by transfer of antigen-pulsed DCs that overexpress TNF-related apoptosis inducing ligand (TRAIL) or Fas ligand (FasL; see Genetic synovectomy, below) [25, 26]. The DCs do not migrate to the joint, and exert their effects in the spleen and lymph nodes. The most sophisticated approach is that from Zhang and coworkers . Those investigators developed a dual adoptive cellular gene strategy in which they transferred collagen type II pulsed antigen-presenting cells, which were adenovirally transduced to express FasL to eradicate antigen specific T-cells and TACI (transmembrane activator and calcium modulator and cyclophilin ligand interactor) to block antigen specific B-cell activation. This dual ACGT completely prevented murine CIA but a therapeutic regimen failed to affect arthritis. These studies show that ACGT has potential in the treatment of early RA, but its implementation requires identification of the arthritogenic autoantigen in RA. Direct (in vivo) transduction in the synovial tissue would be advantageous in the treatment of RA. The retroviruses used in the ex vivo method can only transduce proliferating cells. Injection of a high-titre recombinant retroviral preparation in arthritic joints yields transgene expression , and periarticular administration exhibits therapeutic efficacy . Intra-articular injection of plasmid DNA can transduce synoviocytes but yields only transient transgene expression , whereas plasmid injection into muscle results in long-term expression and circulating levels of transgene. Amelioration of experimental arthritis (streptococcal cell wall [SCW]-induced arthritis or CIA) was achieved after intramuscular transfection of plasmids encoding TGF-β1, IL-1Ra, the soluble p75 TNF receptor–immunoglobulin Fc (sTNFR:Fc; etanercept) fusion protein, or IL-10 [30–34]. For the latter, expression was optimized (level and duration) by electroporation of the muscle. The above studies indicate that the success of gene therapy depends on the efficiency of gene delivery, and viruses have evolved to become superior for transducing cells under in vivo conditions. The most commonly used viruses in gene therapy are adenoviruses, which are non-integrating DNA viruses that, in contrast to retroviruses, can infect proliferating and quiescent cells. Direct injection of adenoviruses into the joint cavity results in significant transduction in the synovial lining. Injection of first-generation, replication-deficient adenoviruses encoding IL-1Ra, human 55 kDa TNF-α receptor, or IL-10 in the knee joint exerts a prophylactic effect on CIA [35–38]. The anti-inflammatory effect of adenovirus-derived IL-4 in CIA was disappointing . However, IL-4 markedly prevented bone erosion. In murine CIA, IL-4 reduced osteoclasts and ingrowth of granulation tissue from the synovial membrane in bone. A therapeutic effect of local gene therapy with adenoviruses was seen with IL-1Ra and IL-13 in murine CIA and rat adjuvant arthritis, respectively [35, 40]. However, it is doubtful that local TGF-β1 gene transfer will be clinically applied in RA because TGF-β1 can cause significant pathological changes such as fibrosis, chondrogenesis in synovium and ligaments, and chondro-osteophyte formation, which can outweigh the beneficial effect on inflammation, as was seen with adenoviral overexpression in rabbit AIA [41, 42]. The disadvantage of adenoviruses is the episomal nature of the viral genome, which is lost during cell division, resulting in short-term transgene expression. A major limitation is the acquired immune response against adenovirus serotype 5 in most humans, and seven out of 10 samples of RA synovial fluid contained neutralizing antibodies . Viruses such as the herpes simplex virus (HSV), adeno-associated viruses (AAVs) and lentiviruses are thought to integrate into host chromosomes, and therefore potentially could have long-term expression, even in proliferating synovium. Current data suggest that the recombinant AAV remains episomal located in cells as the deleted AAV replication (Rep) proteins normally facilitates genomic integration. Injection of a replication deficient HSV (T/0-) encoding IL-1Ra into rabbit knee joint inhibited leucocytosis as induced by IL-1β derived from retrovirally transduced synovial fibroblast allografts . The nonimmunogenic recombinant AAV vectors exhibited an even more attractive transgene expression profile, namely low basal expression and high expression during inflammation. AAV IL-1Ra transgene expression in naïve rat knees was undetectable, but even 100 days later lipopolysaccharide-induced joint inflammation induced rapid upregulation of IL-1Ra . Goater and coworkers  found that the low AAV transduction of the synovium was significantly enhanced in the TNF transgenic mice and correlated with joint damage. This probably relates to the rate-limiting second strand synthesis of the AAV genome in infected cells – a process that could be enhanced by DNA repair processes, as is induced by TNF. Direct injection of the AAV into the arthritic joint resulted in considerably higher expression of the IL-4 transgene than when injected into a naïve joint . In contrast to AAV, lentiviral IL-1Ra transgene expression in the joint was high , but interestingly the transgene expression also increased with joint inflammation . Clinical efficacy of local gene therapy with recombinant AAV expressing the soluble TNF receptor transgene was demonstrated in both spontaneous arthritis in TNF transgenic mouse and SCW arthritis in rat [50, 51]. However, use of lentivirus in arthritis is still in its infancy, but the observed leakage of IL-1Ra transgene into the circulation and other organs  makes lentivirus a less suitable candidate for gene therapy. The clinical course of RA is characterized by variable disease activity, with spontaneous remissions and exacerbations of chronic inflammation in the joint. Expression profiles in experimental arthritis models showed that the relative amounts of cytokines present in the joint vary according to disease state. Ideally, the gene therapeutic approach of cytokine modulation must parallel the intermittent course of the disease, so that the variable physiological demands may be met and undesirable exposure to the agent is prevented. In conventional transfer vectors the transgene is under the control of constitutive viral promoters (e.g. cytomegalovirus [CMV] and long terminal repeat) and they exhibit high, but short-lived, uncontrolled expression of the transgene. High levels of anti-inflammatory proteins might increase the risk for infection, as has been observed in anti-TNF and anti-IL-1 treatment of patients with RA . Furthermore, the homeostatic balance might adapt to unregulated stable concentrations of transgene protein, thus reducing its therapeutic efficacy (tachyphylaxis). A number of vectors with drug-controllable promoters for achieving regulable transgene expression have been developed and used in animal models of arthritis. Over the past 12 years the tetracycline-inducible system (or tet system) has become the drug-regulable gene expression system of choice for in vitro and in vivo applications (e.g. transgenetics and gene therapy) [52, 53]. The tet system comprises three components: the transcriptional modulator, the tetracycline-responsive promoter, and an antibiotic of the tetracycline family. If the drug binds to the original prokaryotic tetracycline repressor (tTA) protein then it uncouples from the tet-responsive promoter (seven copies of the tetR-binding sequence [tetO] upstream from a minimal CMV promoter) and transcription is terminated (tet-off). A mutated version of tetR (rtTA) has the reverse response of activating the promoter in the presence of tetracycline (tet-on). These two tet-systems yield good temporal and spatial expression, but promoter activity leaks, giving rise to relatively high basal levels of transgene. More stringent control is obtained with the repressor variant of tetR (tTs) in combination with the tet-on system. The advantage of the tet system is that the drugs (tetracycline and doxycycline) bind to tetR with high affinity, and these orally bioavailable drugs have well defined pharmacokinetics and dynamics, with negligible side effects. The tet system has been used in two CIA gene therapy studies conducted to determine whether regulated expression of viral IL-10 could be therapeutically advantageous. 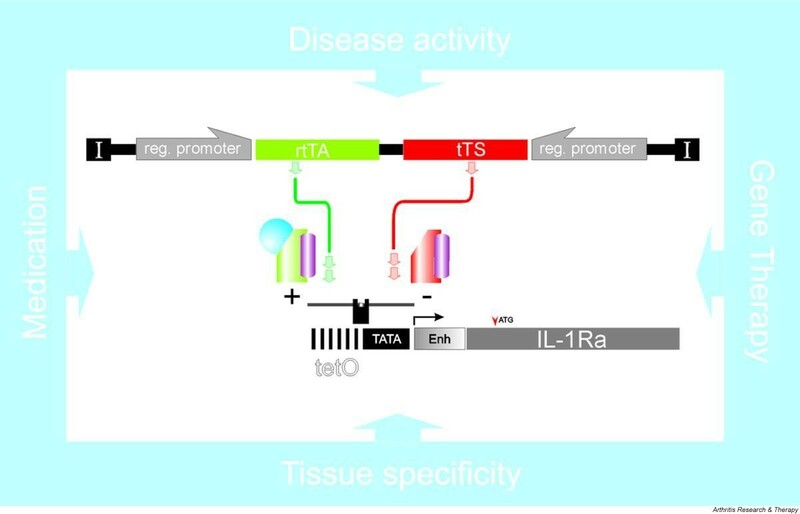 Apparailly and coworkers  used intramuscular coinjection of two AAV vectors – one for the constitutive expression of rtTA, and the other used the tetO promoter for regulated expression of viral IL-10 – before mice were immunized. Doxycycline administration starting 23 days after immunization significantly reduced clinical, radiological and histological CIA scores. The study conducted by Perez and coworkers  used the tetracycline-dependent transcriptional silencer (tTS) for viral IL-10 regulation. The two plasmids were intramuscularly injected and electrotransferred before the onset of disease, and doxycycline treatment resulted in a significant inhibitory effect on CIA. Recently, Gould and colleagues  used an improved vector system with the rtTA (tet-on) expression and transgene expression, both under control of the tetO promoter in a head–tail configuration on one plasmid. The plasmid was electrotransferred intramuscularly in order to yield expression of a dimeric TNF receptor 2, and it was found that prophylactic treatment significantly reduced CIA hindpaw swelling and clinical score in CIA. Similar drug transcriptional regulation systems have been developed for rapamycin and streptogramin, but these have not been tested in experimental arthritis. Clinical application of the above mentioned drug (tet)-dependent promoter systems will be hampered by the need to monitor disease activity in order to tune transgene expression, which is further complicated by the unpredictable and relapsing clinical course of RA. The major challenge is a disease-regulated expression of a recombinant protein to meet the variable demands imposed by RA, which are high during a relapse and low during remission. The acute-phase response, as seen in RA patients, is generally considered to be a marker of disease activity. The group of Varley and Munford  showed that the acute-phase proteins complement factor 3 (C3) and serum amyloid A-3 are particular attractive candidates for transcriptional regulation of cytokine inhibitors. A two-component expression system was made in which the C3 promoter regulates the production of the HIV transactivator of transcription (Tat) protein, which in turn regulates the HIV long terminal repeat promoter to express the transgene of interest . Miagkov and coworkers  and we  independently demonstrated, in two different experimental arthritis models, that it was feasible to use this two-component system in adenoviral vectors using the inflammation-inducible C3 promoter for autoregulated expression of IL-10 and IL-1Ra. This system was highly responsive toward various inflammatory stimuli, including TNF-α, IL-1β, IL-6 and lipopolysaccharide. The Ad.C3.tat/HIV-hIL-10 was injected intra-articularly into the paws of rats previously injected with SCW fragments, and the transgene was induced by reactivation of arthritis with an intravenous challenge with peptidoglycan–polysaccharide derived from group A streptococci. Furthermore, the endogenously regulated IL-10 established a negative feedback loop and prevented influx of inflammatory cells and swelling of the arthritic joints. We used this system to elicit adenoviral overexpression of human IL-1Ra in knee joints of CIA mice and compared this with the effect of IL-1Ra expression under direct control of the conventional CMV promoter. In a prophylactic regimen, we demonstrated superior effectiveness of this two-component IL-1Ra expression system in murine CIA. These two in vivo studies [59, 60] provided proof of principle and demonstrate the efficacy of a disease-regulable expression system in arthritis. However, this promoter may not be suitable for RA because the Tat is a foreign immunogenic protein and may have undesirable effects by transactivating host genes . For future clinical application, novel disease-regulable promoters must be developed that are based on expression of endogenous genes at the site of injury/inflammation and that express no foreign, possibly hazardous components. We demonstrated that a hybrid promoter consisting of the IL-1 enhancer promoter region in front of the IL-6 promoter fulfils criteria of a disease-inducible promoter, namely low basal activity and high activity during acute joint inflammation and flare-up of SCW arthritis . Experiments are ongoing to demonstrate whether disease/physiologically controlled transcriptional regulation is a feasible gene therapeutic approach for autoregulated protein/drug treatment in experimental arthritis. In the future the disease-inducible system will be combined with a drug-regulable expression system (Fig. 3) to provide autoregulation but with the added safety measure of being able to intervene if problems occur. Schematic presentation of potential transcriptionally regulated transgene expression constructs for arthritis. Ideally, the expression of the therapeutic gene should follow the intermittent course of the disease in rheumatoid arthritis, and this can be achieved by using disease-regulating promoters (reg. promoter) for upregulation (promoters from interleukin [IL]-6, complement factor 3 [C3], serum amyloid A [SAA], tumour suppressor gene [TSG]6, heat shock protein [HSP]70) or downregulation (promoters from collagen type II, IL-1 receptor antagonist [IL-1Ra], osteocalcin, tumour necrosis factor receptor [TNFR]) of expression. Disease (cytokine balance) will regulate the expression of rtTA and/or tTS that, only in the presence of doxycycline, can regulate the expression of the therapeutic transgene using the drug-regulable expression system (tet-on/tet-off system). Tissue-specific expression elements either in front or downstream of the promoter must restrict the expression of the site of interest. Furthermore, insulator sequences must prevent cis-acting promoter activities and epigenetic interference on the disease-regulating promoter system. The performance of the transcriptionally regulated expression system will also depend on the vector (integrating/episomal), route of delivery (Fig. 2) and transgene (Fig. 2). Because safety is paramount, it must be possible to delete the transduced cells (e.g. by introducing a thymidine kinase gene in case of a worst scenario; not included in the illustration). I, insulator; Enh, enhancer elements; rtTA, reverse tetracycline-modulated transcription factor; tetO, tetracycline repressor-binding sequence; tTS, tetracycline-modulated transcriptional suppressor. Cytokine modulation has also been achieved by intervening at the receptor signal transduction level in cells. The transcription factor nuclear factor-κB (NF-κB) is a pivotal signalling molecule for various stimuli (stress) and cytokines such as IL-1, IL-18 and Toll-like receptors. Local inhibition of NF-κB activation by adenovirally mediated overexpression of a dominant negative form of IκB kinase-β (IKKβ), IκB-α, or decoy oligodeoxynucleotides all ameliorate disease in three arthritis models in the rat [63–65]. Furthermore, inhibition of NF-κB activation leads to marked apoptosis of synovial fibroblasts in these animal models, and enhanced TNF-α-induced apoptosis in RA synovial fibroblasts . It was recently discovered that the tumour-like growth and insensitivity to apopotosis of RA synovial fibroblast is due to phosphorylation of signal transducer and activator of transcription (STAT)3 in these cells . Periarticular injection into the ankle joints of mice with AIA or CIA of an adenoviral vector encoding the natural inhibitor of STAT3 phosphorylation, suppressor of cytokine signalling (SOCS/CIS)3, drastically reduced severity of arthritis in both models . STAT3 and Ras/extracellular signal-regulated kinase are two signalling pathways of the cytokine receptor gp130, and adenovirally mediated Ras DN gene transfer into rat ankle joints ameliorated adjuvant arthritis . The disadvantage of intracellular targeting is the need to achieve a high infection rate in synovium in order to elicit a full-blown effect. However, increasing the amount of viral vector does not increase the number of synoviocytes targeted, but instead provokes an inflammatory response. Several groups have attempted to combine gene transfer with protein transduction to enhance the target range to noninfected neighbouring cells. Cargo peptides, such as the 11-amino-acid region of the HIV transactivator protein (tat), can facilitate the transmembrane transport of fusion proteins. However, this cargo protein cannot mediate intercellular transport of tat fusion proteins between the adenovirally transduced and noninfected cells . On the contrary, the tat fusion proteins are directed to the nucleus of the infected cells (unpublished data). This does not support the concept of combining gene transfer and protein transduction to broaden the range of activity of the transgene to non-transduced cells. Another more drastic approach to silencing the inflammatory and destructive process is by killing resident cells in the arthritic joint. This approach is called genetic synovectomy, and it is the latest development in the tradition of synovectomy, as performed surgically, chemically or by radiation therapy. In RA the fibroblast-like type B synoviocyte is a transformed cell that exhibits unrestrained proliferation, lacking contact inhibition in vitro, and elevated expression of the pro-oncogene c-myc. A gene therapeutic approach is to induce apoptosis of RA transformed synoviocytes using TRAIL (Apo2L) or FasL (CD95L). TRAIL and FasL are type II membrane proteins and activate death receptors for transduction of apoptotic signals. Activated lymphocytes and synoviocytes from RA patients express TRAIL receptors, and adenoviral TRAIL gene transfer induced significant apoptosis in RA synoviocytes . High Fas expression was identified in inflamed synovium, and in infiltrating leucocytes in RA and animal models of arthritis. Okamoto and coworkers  showed that FasL is capable of Fas-mediated apoptosis of human RA synoviocytes. Adenoviral gene transfer of TRAIL into rabbit knee joints 4 days after transplantation of IL-1β-expressing synoviocyte allografts resulted in pronounced apoptosis of synoviocytes, and inhibited local IL-1 effects . Also, adenoviral FasL gene transfer induced apoptosis of the synoviocytes and markedly ameliorated CIA in mice . A more selective approach is to target the tumor suppressor molecule p53. The p53 gene is upregulated in the RA joint, and evidence is accumulating that this gene is mutated and acts as a dominant negative inhibitor of wild-type p53 in the RA synovium [74, 75]. It is postulated that the same oxidative stress that induces DNA damage and apoptosis in cells can also cause p53 mutations that transform cells resulting in aberrant proliferation . Mutated p53 is considered responsible for the transformation of synovial fibroblasts into invasive phenotypes that are destructive to cartilage and bone . The p53 protein is a key regulator of inflammation, because induction of CIA in p53 gene knockout DBA1/J resulted in the development of more severe arthritis . Adenoviral transfer of the p53 gene into rabbit knee joints with IL-1β-expressing synoviocyte allografts resulted in pronounced apoptosis of synoviocytes, and marked reduction in inflammatory exudates . The p53 protein is strictly maintained in its inactive form under normal conditions, and the tight post-translational control also implies for exogenously added p53 . This could suggest that local p53 gene delivery to arthritic joints is a safe strategy. An alternative approach to induction of p53-mediated cell death is to use conditionally replicative adenoviruses (CRAds) . CRAds can only propagate in the absence of a functional p53 gene, and thus they can selectively kill transformed synovial fibroblasts in a self-limiting process. Furthermore, CRAds can be used for intra-articular viral propagation, and so extend the range of transgene activity and link the duration of expression to the presence of transformed synoviocytes. The somatic p53 mutation has not been described in experimental models of arthritis, and therefore this treatment with CRAds might not be effective in animals. However, inducing cell toxicity by introducing the HSV thymidine kinase (TK) gene is effective in animal models. HSV-TK can phosphorylate the nontoxic prodrug ganciclovir into ganciclovir triphosphate, which causes chain termination and single-strand breaks upon incorporation into DNA . As a consequence, cells go into apoptosis by a process that is largely unknown. An advantage is the so-called 'bystander effect', by which HSV-TK can affect even cells in which the gene is not introduced . This suicide gene system was evaluated in experimental arthritis by intra-articular injection of HSV-TK expression plasmids and adenoviruses in AIA in rabbits and in CIA in rhesus monkeys, respectively [84, 85]. Subsequent treatment with intravenous ganciclovir increased apoptotic cell death in the synovium and cytolysis of the synovial lining layer in both arthritis models. An alternative approach for suicide gene therapy is to inhibit cell proliferation. The cell cycle is controlled by the kinase activity of cyclin/cyclin-dependent kinases and their inhibitors p16 (INK4a) and p21 (Cip1). Forced overexpression of either p16 or p21 by adenoviral vector transduction of the synovium inhibited in vitro growth of RA synovial fibroblasts and inhibited pathology in rat adjuvant arthritis [86, 87] and murine CIA . These cyclin-dependent kinase inhibitors not only prevented synovial growth (pannus formation) but also suppressed the expression of the proinflammatory cytokines IL-1β, IL-6 and TNF-α  and of degrading proteinases . At least for p21, it has been shown that it also can inactivate NF-κB and activator protein-1, showing that these cyclin-dependent kinase inhibitors may have a much broader therapeutic spectrum. The therapeutic efficacy of genetic synovectomy can be improved by cell-specific targeting of transformed synoviocytes. Fibre knob modification by introducing a RGD motif changes the tropism of the adenovirus and transduced the synovial fibroblast more efficiently than did the conventional adenovirus in vitro (Table 1) and in rat ankle joint . We previously showed that IL-1Ra gene therapy was more efficacious in the treatment of murine CIA when using RGD modified adenoviral vectors . RGD modification may direct the adenovirus to the transformed synovial fibroblast, and studies are in progress to combine cell targeting with genetic synovectomy in experimental arthritis. The normal synovium is highly vascular, and in particular the synovium lining region has a dense microvascular network. Detailed morphometric studies have indicated that chronic rheumatoid synovium may induce changes to the microvascular architecture, consisting of reduced vascular density within 50 μm of the synovial surface with concurrent angiogenesis in the deeper synovium . Angiogenesis is central to the development and perpetuation of rheumatoid synovitis. Vascular endothelial growth factor (VEGF) promotes angiogenesis, and VEGF expression correlates with disease severity in RA patients and in murine CIA. Intravenous injection of adenoviruses expressing human soluble VEGF receptor 1 at the onset of murine CIA significantly reduced paw swelling and disease severity . TNF is a proangiogenic cytokine, and direct injection of a lentivirus expressing endostatin, an antiangiogenic peptide derived from collagen XVIII, into the joints of mice transgenic for human TNF before the onset of arthritis reduced vascularization and overall arthritis index 8 weeks later . Transplantation of retrovirally transduced NIH3T3 cells expressing the angiostatin gene, an internal fragment of plasminogen, into the knee joint of DBA1/J mice before the onset of CIA dramatically reduced pannus formation (invasive tissue of fibroblast-like cells in cartilage and bone) and cartilage erosion as a result of the prevention of angiogenesis . The enzyme plasmin is essential to endothelial cell migration, and systemic adenovirus mediated overexpression of the urokinase plasminogen activator receptor molecule prevents angiogenesis and, as a result, ameliorates CIA . This indicates that inhibition of angiogenesis can suppress synovitis, pannus formation and related connective tissue destruction, but the safety of this gene therapy approach was not evaluated in those studies. RA is a polyarthritic disease and is bilaterally symmetrical in patients. The cause of this symmetry has not been elucidated but it has gained renewed scientific attention because of the observed protective effect of local gene therapy on distal joints. We demonstrated that local IL-1Ra gene transfer (adoptive and viral method) prevented development of murine CIA arthritis in the treated knee, but also in the proximal hind paw and to the same order of magnitude [15, 35, 60]. A contralateral effect on the knee was seen with a combination of adenoviral overexpression of IL-1 type I receptor–IgG fusion protein and TNF soluble type I receptor protein in AIA in the rabbit . We recently demonstrated that a monoarticular SCW-induced gonarthritis induced NF-κB activation in the contralateral joint without inducing joint inflammation, and blocking IL-1 partially (50%) reduced this response (unpublished data). Local treatment of SCW arthritis with NF-κB decoys also resulted in significant inhibition of arthritis in the contralateral joint . It is therefore not surprising that local gene transfer of cytokine modulators such as IL-10 and IL-4 also conferred protection in the proximal ankle joint [37, 39], in the contralateral knee [97–99] and even in the untreated front paws . In our experiments we could not detect IL-10 or IL-1Ra in the blood circulation, and others found no evidence of systemic overflow of locally synthesized transgene proteins (IL-4, soluble IL-1 receptor I, soluble TNF receptor, IL-1Ra) [15, 37, 39, 96]. A likely explanation for the remote protection conferred by local gene therapy is the reduction in local production of proinflammatory cytokines, thereby reducing their circulating levels and abolishing a sensitizing effect on naïve joints. A conflicting finding was the protection of the ipsilateral hind paw by adenoviral overexpression of IL-10, which was seen in the absence of a local anti-inflammatory response in the knee . There is compelling evidence that this protective remote effect could also be accounted for by immune modulation. Transfer of soluble IL-1 receptor accessory protein-producing NIH-3T3 fibroblasts into knee joint inhibited murine CIA in this joint, but it did not protect the distal paws from developing CIA. Soluble forms of IL-1RacP, in contrast to IL-1Ra, were unable to inhibit the antigen and mitogen-induced T-cell proliferation [16, 101]. Circumstantial evidence for T cell involvement in the remote protection was obtained by local adenoviral delivery of a gene encoding soluble cytotoxic lymphocyte antigen (CTLA)4, which effectively delayed the onset of CIA in the knee but also in distal paws . Antigen-presenting cells play a key role in T-cell differentiation and activation, and implantation of genetically modified bone-marrow derived DCs expressing IL-4, FasL, IL-1Ra or CTLA4-Ig in mice with established CIA resulted in almost complete remission of disease via suppression of the Th1 response [26, 39, 72, 103]. Whalen and coworkers  demonstrated that genetically modified macrophages or DCs expressing viral IL-10 in the presence of antigen can result in T-cell unresponsiveness, thereby inhibiting a delayed-type hypersensitivity response in mice. Evidence is emerging that injection of exosomes (liposome particles of 40–100 nm diameter) derived from antigen-loaded DCs that are isolated from cell-culture can suppress a delayed-type hypersensitivity response in a class II MHC, B7 and CD86 dependent manner in animals (Robbins P, personal communication). Lechman and coworkers  showed that adenoviral transduction of the synovum with viral IL-10 caused an antigen-specific immunosuppression in AIA. It remains to be seen whether local gene therapy can transduce or educate the immune-regulatory cells that are present in the inflamed joint or in the lymph nodes via clearance of vectors or transgenes to the lymphatic system. In RA patients the draining lymph nodes of inflamed foot joints had higher levels of proinflammatory and anti-inflammatory cytokines than found in serum; furthermore, the levels reflected disease activity . Spillover of cytokines or inhibitors to the draining lymphatic system could, respectively, boost or suppress the immune response, and this may affect spreading of the disease to other joints. Joint inflammation is a chain of events from cell activation, chemokine and cytokine production, adhesion molecule expression, and influx of inflammatory cells in an escalating process that is precisely regulated. Probably depending on the transgene expressed, the chain can be broken in an antigen-specific or nonspecific manner, resulting in a distal protective effect. The above studies proved the feasibility of local gene therapy, demonstrating a promising protective effect on nearby joints, and if fully understood then this could be of great significance for the implementation of local gene therapy in RA patients. The first gene therapy trial in RA patients was started in 1996 and is now completed . Nine postmenopausal women with advanced RA received autologous synovial fibroblasts retrovirally transduced to express IL-1Ra in the second to fifth metacarpophalangeal joints. One week later these joints were replaced and synovial tissue exhibited IL-1Ra expression, whereas the joints receiving control cells were IL-1Ra negative. No adverse effects were recorded in these patients. Three other phase I gene therapy trials are in progress using the 'ex vivo' method of IL-1Ra transduced synoviocytes in RA, and TGF-β transduced chondrocytes in degenerative arthritis . Furthermore, two phase I gene therapy studies in RA have been approved; the studies involve direct intra-articular delivery of either plasmid encoding the HSV-TK gene or AAV serotype 2 containing the human TNF receptor–Fc immunoglobulin fusion gene (tgAAC94). The latter gene therapy trial is a double-blind, randomized, placebo-controlled, dose escalation study of intra-articular administration of tgAAC94 in four cohorts of eight RA patients, each of whom will be followed for 24 weeks (protocol 13E04; Targeted Genetics Corp.). A concern centres around the fact that the rheumatoid factors in RA patients may form immune complexes with the immunoglobulin domain of the tgAAC94 fusion protein, thereby inactivating the therapeutic protein in the arthritic joint. Moreover, epidemiological studies showed that 80% of the human population has antibodies directed against AAV2, with 30% expressing neutralizing antibodies. It was recently observed (Tak PP and coworkers, unpublished data) that the synovial transduction efficacy of AAV5 is far higher than that of AAV2 vectors, and thus the former is the vector of choice for future gene therapy trials. The number of gene therapy trials in RA is in sharp contrast to the more than 600 clinical trials of gene therapy in patients with cancer. Although not a life-threatening disease, the balance of risks and benefits of gene therapy is favourable in RA. The advantage in RA is that the (viral) vectors can be injected into the enclosed joint cavity, with minimal risk of leakage to the blood circulation. Because of this, precise targeting is not needed in RA, unlike in the treatment of cancer. Findings reported here show that many targets have already been defined and gene therapy strategies developed that exhibit high success rates in experimental arthritis. Apart from local effects in the injected joint, it is becoming increasingly clear that local treatment also affects arthritis in nearby joints. This is an intriguing and general finding, which may expand the therapeutic applicability of gene transfer in human arthritis. Drug-regulated and/or disease-regulated transgene expression will increase the efficacy and safety of local gene therapy. Gene therapy in RA is still in its adolescence, and more clinical studies must be initiated if it is to mature. It is, however, imperative that gene therapy studies in animal models of arthritis should be continued, especially involving the application of a new generation of viral vectors (e.g. 'gutless'), nonviral vectors such as artificial chromosomes, and novel strategies such as RNA interference by siRNA (small interfering RNA) or ribozymes. Most animal studies described in the present review used gene therapy for prophylactic treatment of arthritis. Not only the choice of trangene but also those of promoter, vector and delivery route could be quite different in established disease. In that sense, the transfer of RA synovial tissue explants in severe combined immunodeficiency mice is an elegant model with which to evaluate gene therapy [21, 72, 108–110]. The data in animal models show that gene therapy is safe, but it is important to obtain data on shedding and safety of the various viral vectors after local application in RA patients. Also, comparative studies should be conducted on synovial tissue biopsies or in vivo to determine the best vector for gene delivery. The obtained clinical data for should provide us with an outline of the strategy (target, vector choice and delivery route) for RA and provide new insights for further preclinical studies to improve gene therapy for RA. This work was supported by grants from the Dutch Arthritis Association (304, 403) and the Dutch Organization for Scientific Research (917.46.363).